straight toque with tami,eh? : Who Here Likes Shopping? Boy I've neglected my blog. You'd think that with all of this "extra" time on my hands, what with being a teacher and all, I'd be a bloggin' fool. Nope. I've been busy doing other things. Like giving lots of sugar to my new granddaughter, Eloise. I promise I won't make reference to her in every post I make. Besides being obsessed with Elle, I have been working on my own Etsy shop. Yup! This is something I've been wanting to do for a while now. Plus, I thought it would be a great way to make a little cash to help pay for Melissa's very exciting upcoming wedding. It's funny how scared I was to actually jump in and try to sell my wares over the internet. What if no one buys anything? What is people think my work is ugly? What if some stalker dude starts stalking my shop? Before I could press that key to "open" the shop, I had two big decisions to make. My best friend Kathe replied: "Who the HECK is Mrs. Malty? Is she like, Mrs. Doubtfire?" No, Kathe. It is actually the name of a very special story that has been handed down for many generations through my mother's line. It is oral. I'm not sure it has ever been written down. I've often wanted to write it out and have Terry illustrate it. But, I really feel like it would take away some of it's charm. I recently told it to my twin granddaughters Lyla and Olivia. I always hold my breath for the desired effect at the end. Sure enough..."Tell it again!" It is very special. So...that's how that name came to be. However, when I was signing up, for some reason, I ended up with TWO shops named "Mrs. Malty". So, if your looking for it, here is the link. Or search the shops for "CANADIANTAMI". I've been obsessed with making, yes making, baby/toddler shoes. I really wanted to sell those (and I will add them later) but it didn't feel right. Then, I wanted to sew children's dresses (and I will add them later) but that didn't feel right. Then, out of my own curiosity, I taught myself to do shirring. It is really simple and I made up a few skirts. Then added a bodysuit and a headband. I took it to Erika in the hospital and she loved it. In fact, baby Eloise wore her little outfit home from the hospital. I just love the little skirts and tops. The little rosettes on the bodysuit and headband are so sweet. They was up really nicely as well. All in all, I'm very pleased with the outcome. So, so cute! Now I wish I had a little girl to buy for! The only babies we are expecting in my family anytime soon are boys. So.... Do you make them for older girls like 3 to 4T-ish? I can make them in ANY size you'd like. Seriously. Emma loves skirts, so I will have her take a looksie at which one she likes best and we will be in touch. One more question. 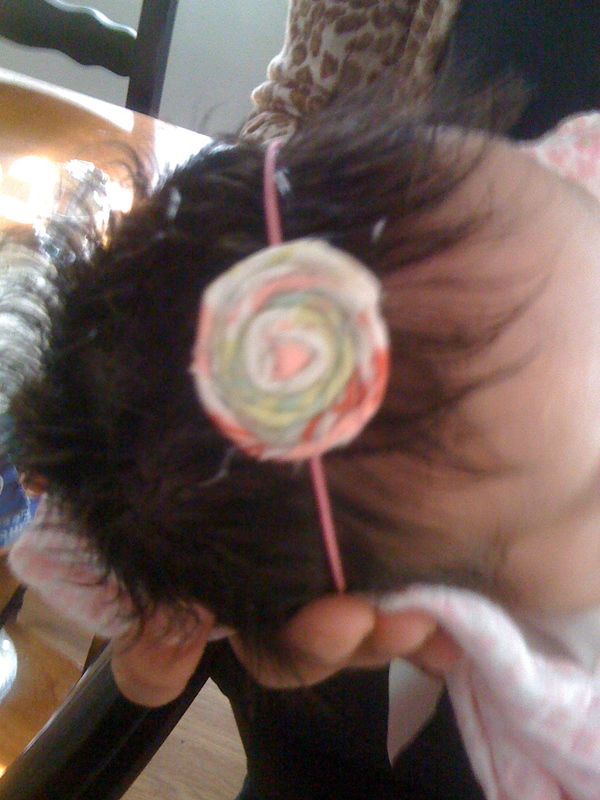 Can you just leave the flower off the headband so I can attach it to an alligator clip? Head bands just DO NOT like to stay on Emma's head and then end up lost. I just linked it up to our blog under "stamp of approval"
i gotta get me another baby girl! I just saw your reply to Nat. :D Kirsten's size??? Perhaps?? ?